Nike CEO Mark Parker joins Disney's board. WALT DISNEY WORLD POLO BY NIKE GOLF. IMAGE SOURCE: DISNEY. Disney (NYSE:DIS) has added Nike (NYSE:NKE) CEO Mark Parker to its board of directors. He joins a star-studded group, and his appointment should pay dividends for shareholders of both companies for years to come. Here's why. Parker graduated college in 1977 and joined Nike as one of its first footwear designers two years later. He has been at the company ever since, became CEO in 2006, and is scheduled to replace founder Phil Knight as company chairman this year. Since Parker became CEO, the company's stock has crushed the S&P 500. Even with a market cap around $100 billion, the company continues to grow and was the best-performing Dow stock of 2015. Parker is not a name you're likely to hear bandied about at cocktail parties, but he is one of the best CEOs in America. Fortune named him the 2015 businessperson of the year and wrote, "Parker is a soft-spoken shoe designer, known for a thoughtful if demanding management style." A board of directors acts as a fiduciary to look out for the best interests of shareholders. Approval of executive compensation, dividends, share buyback authorizations, and the hiring and firing of executives are among the responsibilities of the board. Companies can derive extra benefit from having board members with particular areas of expertise. For instance, having a Microsoft executive on the board of a directors of a low-tech company can provide the C-suite with some insight into modern technological advancements. While the board member won't be involved in day-to-day decisions, his or her advice at a macro level can be invaluable to the executive team. Disney's 12-member board is a star-studded group. From the social-media sector it includes the CEO of Twitter, Jack Dorsey, who is also CEO of Square; and the No. 2 at Facebook, COO Sheryl Sandberg. Not only are they both tremendous businesspeople, but they also bring a perspective and skill set that's different from Disney's core competency. Disney has a treasure trove of IP and monetizes it in a number of ways, including theme parks, movies, games, and merchandise. Twitter and Square CEO JACK DORSEY, Disney BOARD MEMBER SINCE 2013. IMAGE SOURCE: DISNEY. One of its crown-jewel assets, ESPN, has done a marvelous job of integrating Twitter and Facebook on both ESPN.com and its broadcasts. The ESPN.com homepage features a space for athlete tweets that the editors think will be interesting to readers. A story on SportsCenter about a big game or a fired coach will invariably feature a handful of tweets from players, fans, and others that add additional insight and color. Bob Peck of SunTrust wrote that the ESPN SportsCenter app saw an increase in usage after Twitter further integrated its service in 2013. Some of this success likely has to do with having Dorsey and Sandberg on its board. Sandberg has been on the Disney board since 2010. Great companies and leaders benefit from being around other great companies and leaders. Both Disney and Nike succeed, at least in part, by taking commodity products, imbuing them with something special, and charging premium prices. Whether it's Michael Jordan, Mickey Mouse, Tiger Woods, or Star Wars, the fundamental blueprint is the same, but they can help each other in various areas. In the press release announcing Parker's board appointment, Disney CEO Bob Iger specifically mentioned "his broad experience in international markets." Success in China is important for Disney's future and Parker can help it understand the Chinese consumer as his company is roaring ahead there. Disney is making an effort to increase international sales, especially in China. This includes licensing deals, movie box office receipts, and the opening of its Shanghai theme park. Its Asia-Pacific revenue was about 1/10th of its U.S. and Canada revenue in 2015, so while Disney is making progress internationally, it remains mostly a North American story. For Nike, in the six months ending Nov. 30, 2015, the athletic apparel company did $1.824 billion in sales in Greater China. This is 25% of the amount sold in North America and it remains the company's fastest-growing region at 27% YOY. 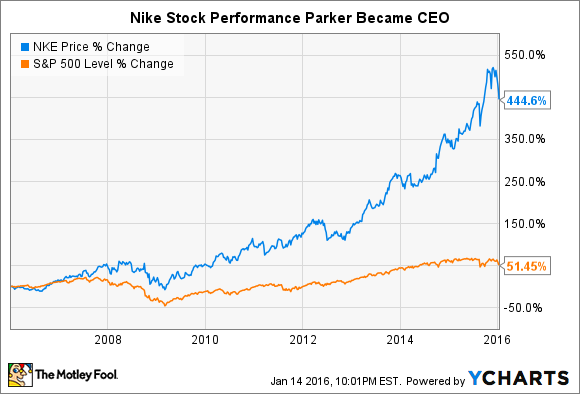 For Parker, being exposed to individuals such as Sandberg and Dorsey a few times a year, and building a relationship outside of the boardroom, has the potential to make Nike a stronger company as well. Nike uses social media, especially Twitter, Facebook, and Instagram (owned by Facebook) to advertise and connect with customers. Each one of Nike's Instagram posts gets hundreds of thousands of likes and thousands of comments. Its Facebook page has over 23 million fans and it boasts tens of millions of more fans on its pages for specific sports such as Nike Soccer and Nike Football. Its main Twitter feed has nearly 6 million followers and is used to advertise products and show inspirational messages that reinforce the company's "Just Do It" ethos. Having the ear of top execs at Twitter and Facebook could open up good things for Nike. Disney and Nike have been two of the best companies and stocks for decades. They have great opportunities for growth both domestically and internationally, and I expect them to provide market-beating but not spectacular returns over the next 10 to 20 years. Having Parker join Disney's board should contribute to this success.